Cicero, N.Y. - The organizer of the Central New York Boat Show has received marine industry honors in part for its annual boat show held each February at the New York State Fairgrounds in Syracuse, NY. The Marine Retailers Association of the Americas has named the Boating Industries Association of Upstate New York/BIA, headquartered in Cicero, NY, as the 2014 Bill Ferguson Award winner for outstanding service by a marine trades association to its members and to the boating industry. ‘The Boating Industries Association of Upstate New York is tremendous in terms of the service it provides to its members. The group puts on an impressive boat show each year, works tirelessly to promote and advocate for safe boating, and goes above and beyond to support member education,&apos; said Marine Retailers Association of the Americas Vice President Liz Walz. 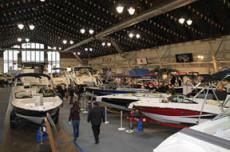 The 2015 Central New York Boat Show February 11-15 will fill three buildings with more than 500 boats, water recreation equipment, marine accessories; boating, fishing and Adirondack guides; charter services; waterfront destination exhibits; and boating safety information and seminars. In-water demonstrations sponsored by BIA and offered by New York Sea Grant and the US Coast Guard Auxiliary educate show visitors on how to select the proper life jacket for all ages and the family dog, and have included canoe and kayak safety information. The Marine Retailers Association of the Americas also the BIA for the crowning achievement of the Discover Clean & Safe Boating campaign, developed in partnership with New York Sea Grant. Each year since 2008, a different type of vessel has served as the Clean and Safe Boating educational vessel, travelling the state to boat shows, waterfront events, Empire Farm Days, and, in 2014, to the New York State Fair. The vessels are equipped with all the required and recommended gear for clean, safe and lawful boating. To date, the campaign has educated more than half a million boaters about how to be legal, safe and environmentally friendly on NY waters. "These are just a few of the myriad ways the Boating Industries Association of Upstate New York provides outstanding value to its members and helps bolster the marine industry overall," Walz notes. The BIA serves members located throughout New York State, primarily in the Central NY, 1000 Islands, Finger Lakes and Oneida Lake regions. More information on BIA is online at www.cnybia.com. Find the Discover Clean and Safe Boating campaign at www.seagrant.sunysb.edu/articles/t/great-lakes-boating-marine-trades-topics.